'The Widow's trailer does a remarkable job of setting the tone of this thriller. There's danger, guns, despair and mystery all hidden within a stunning African setting. 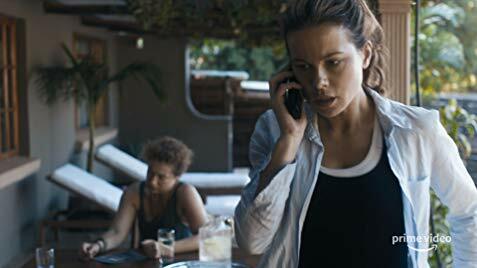 'The Widow' is a highly anticipated British series starring Kate Beckinsale slated to release on March 1 and the show's first ever trailer is already out. There's a lot to understand, question and ponder about in the 2-minute-long trailer but it does answer our question if Kate, who plays Georgia Wells, is actually chasing a "ghost," or if her husband survived the plane crash. Teasing a rather complicated mystery, Georgia is heard questioning "where is my husband?" as she rides through a jungle. A woman whispers, "Georgia, people just don't walk away from a plane crash, they don't just fall out of the sky and carry on with their lives," and a man's voice chimes in: "We are chasing a ghost." A flashback is immediately shown, Georgia and her husband Will Mason (Matthew Le Nevez), share a loving relationship. He gifts her a ring for their anniversary, shortly before he goes missing, or perhaps died. Legendary actor Charles Dance, who plays Martin Benson, gives grieving Georgia an advise that she immediately dismisses. "You really need to forget about all of this. He died on that plane," he says. "They never found his body," she quips. As she embarks on a journey to find her husband in the Congo, crazy events start to unfurl. Reports of a survivor emerge and Georgia questions "Is it him? Is it Will?" "Do you think I am crazy?" questions Georgia and she is assured that she is just missing her husband. "I promise you, I will find him," she fiercely states, and we then see her surrounded by masked men with guns. A cryptic message is left in her car that reads "go home." The action kicks off and Martin tells Georgia that huge sums of money have been transacted from her account after the crash. A mysterious call alerts her about a CCTV footage of her husband, looking as if he is being held hostage by a man. "My husband, what happened to you?" she questions looking terrified. "Someone planted a bomb on that plane," someone is heard telling her over the phone, and Martin avidly adds "and we are going to find out who." The tension rises, the background music gains momentum and Georgia is attacked. First, her car bursts into flames, then there's a public protest and she is seen surrounded by gun-toting terrorists. "Somebody just tried to have you killed. The only thing you should be doing is getting far away from this place as you can," says Martin. She is seen running as the men start shooting. "None of this makes any sense," Georgia stresses, and Martin, yet again gives an advise she ignores. "You should go home before anyone gets killed." The trailer concludes with her pointing a gun at someone and questioning "What have you done with my husband?" Perhaps that's the only answer, we need to know now because just like Georgia, we believe her husband is alive. 'The Widow' premieres on March 1st on Amazon Prime.